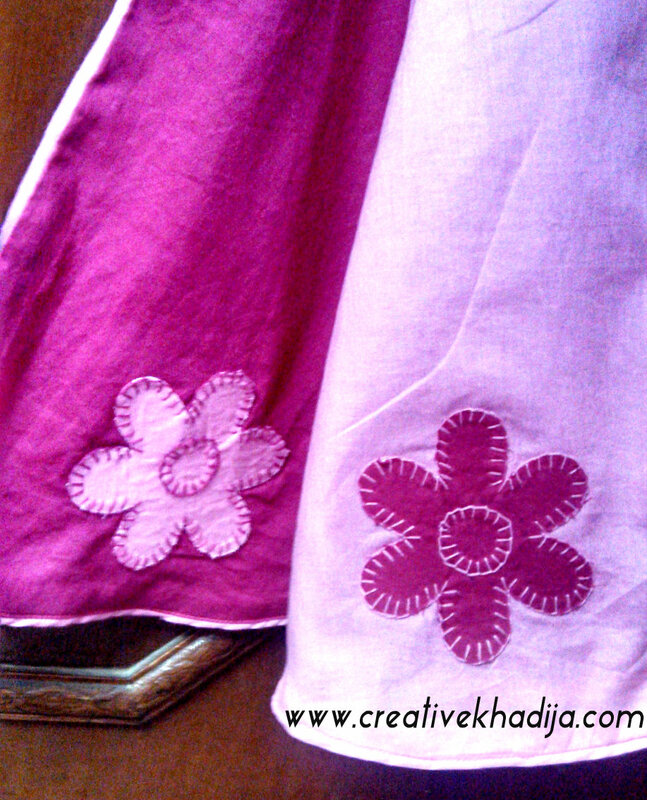 I am sure you will love these designs & hand embroidery! 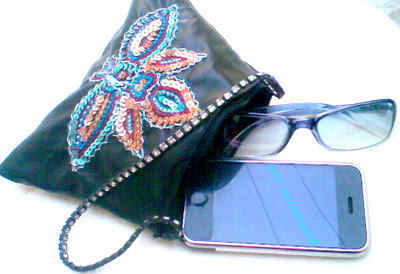 Its Zardosi work,,decorative embroidery!! 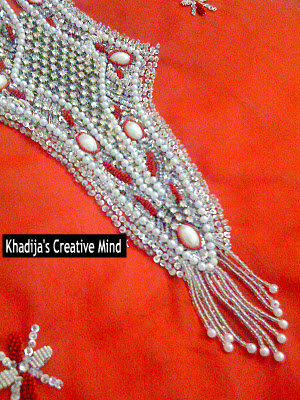 A thick Design on Neckline..filled with beads,sequins & pearls with a silk thread embroidery! Shirt’s border.! I like her designs! This is a lemon yellow cuteness!its not completed yet,all these dresses are not completely done !she is working on these days..
One thing more I would like to share!! A friend(next door to us) got married last month, I want to share some of her bridal look images! 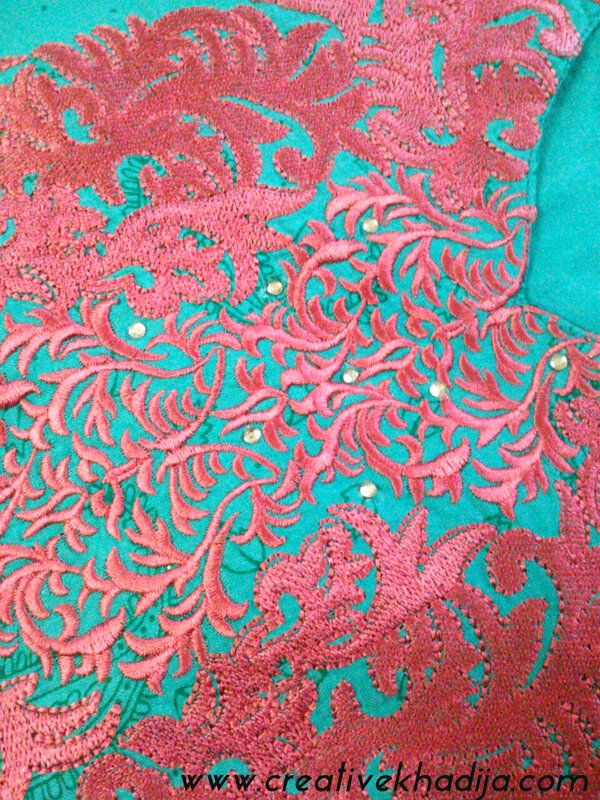 & her Heavy Embroidered Dress pics! I am sure You will like the bridal outfit(its too expensive) the embroidery technique & material is the same on her dress which I have shared above! 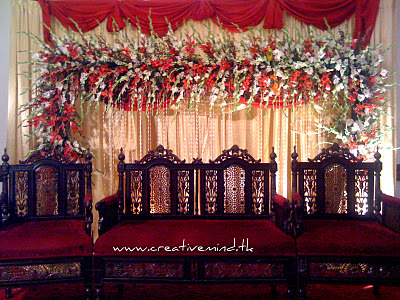 This was the stage for bride n groom,designed with fresh flowers..! it was an evening function,that’s why lighting is dim! 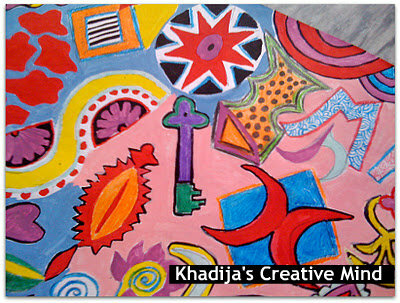 HOLA KHADIJA !!!!! ME HAS DEJADO CON LA BOCA ABIERTA !!!!! QUE PRECIOSIDAD DE BORDADOS !!!! REALMENTE ARTISTICO. HAY QUE ADULAR MUCHO A LA ARTISTA , YA QUE ESTO TIENE MUUUUUUUUUUUCHO MERITO. MUCHOS BESITOS DESDE CADIZ, ESPAÑA. LOVED IT .SO COLORFUL .SO BEAUTIFUL ;). Super bonito o bordado da blusa vermelha. dear Sultana,the dupata border is having rich decorative embroidery! & it was a heavy dress :) my friend was feeling tired wearing this heavy dress but looking cute!!! How elaborate and beautiful! There is no way I would ever have the patience. Que maravilla de bordados !!! Son obras artisticas verdaderamente. El vestido será caro pero una belleza ! Gracias por compartir estos diseños amiga. The wedding dress is amazing – she looks like a fairy tale. My favorite element is the embroidered hem of the skirt. And the flowers behind the stage are so fabulous. All your friend’s hand work is stunning to see in closeup! oh gosh.. thats lovely!! 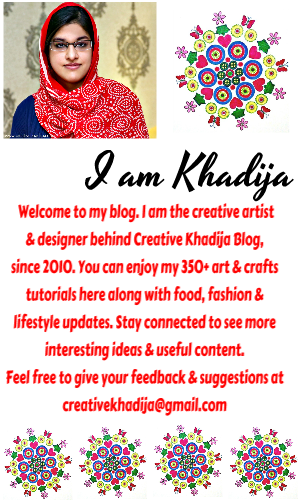 the embroidery that your friend made is amazing.. Love how you’ve put the pics together..
khadiija,yours and your friend works are very elegant.such a nice work.nice sharing.my wishes to you both. All of that embroidery is so beautiful and detailed! It must take such a long time and a lot of patience! I’m super impressed! 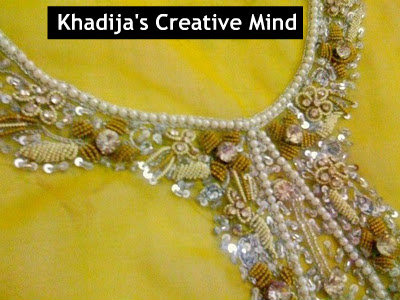 Amazingly detailed embroidery and beadwork! Can you imagine the hours of work?… I can’t!!! I love the flowers on the stage! Is that a garland? It is GLORIOUS! Thank you all sweet friends! the hoop seems like a bed & people sit around & work on a project! wow such lovely creations!! Happy valentine’s Day hun!! Thank You friends..The outfit & other embroidery work in this post is not done by me..bridal dress is from a designer & other are my friend’s collections..
GORGEOUS! I am so glad that these types of art are being passed down through generations and not dissappearing. How special to have it done by hand and not a machine. Bahut Khoob.. Its too beautiful..
Hey Khad..great post.. beautiful bride and her dress is super dooper !!! I bet u had fun for the wedding !!!! love you..xoxo.B. Hi! You really have creative mind.Loved your style,beauty and sophisticated. Wow! What a gorgeous dress.. just love all of the fabulous little details.. so intricate! Thanks so much for sharing with the Pink Hippo Party.. can’t wait to see what you share next! 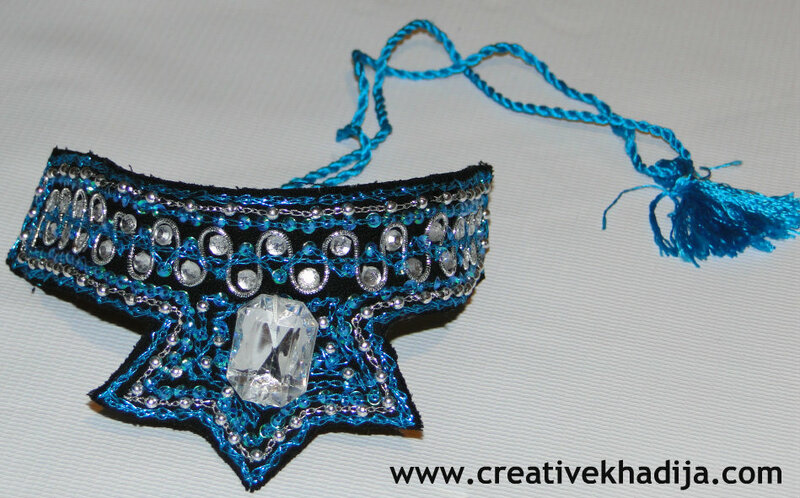 Such incredibly beautiful embroidery and beadwork. wow… beautiful pics… thanks for sharing..